Do you ever have one of those days that you can’t wait for it to get over… nothing wants to go right… and the day drags on and on? Well I had one of those days today, thank goodness it’s Friday and the weekend is ahead. So what do you do when you have one of those days? I decided to treat myself to a little bit of chocolate heaven, a chocolate souffle to be exact. I have wanted to make a chocolate souffle for sometime now and today was the perfect day to do so. I was amazed how simple it was to make, yes there are a few steps to making one of these yummy desserts, but it didn’t take too long and the result was definitely pure chocolate heavenly bliss. The souffle was light and fluffy and well just plain delicious. It had just the right amount of chocolate and it is not one of those desserts that are overly rich. This was the perfect dessert to chase away the dark clouds that were hanging over head and bring a smile to my face. 1. Preheat the oven to 375 degrees F. Use 1 tablespoon of the butter to grease 8-ounce ramekins or custard cups. Coat the ramekins with granulated sugar, tapping out the excess. 2. Separate the egg yolks from the whites and set aside. 3. In a medium microwave safe bowl, microwave the chocolate chips and the remaining 2 tablespoons of butter in 20 seconds intervals, stirring between each interval, until the chocolate chips and butter are melted and form a creamy mixture. Stir in the vanilla and egg yolks one at a time. 3. In a clean bowl, use an electric mixer to beat the egg whites, sugar, salt, and cream tartar until stiff peaks form. Gently fold the chocolate into the egg white mixture. Spoon into the prepared ramekins. 4. Place on a baking sheet and bake in the preheated oven for 20 minutes until puffed and set. 5. Remove from oven dust with powder sugar and serve immediately. Those came out beautiful, that picture belongs in a magazine. I need to go buy some ramekins now. I do dislike those days, and hope yours is well and truly over now. This looks like just the thing to rescue it slightly at least! Urm…yep, it looks pretty perfect! 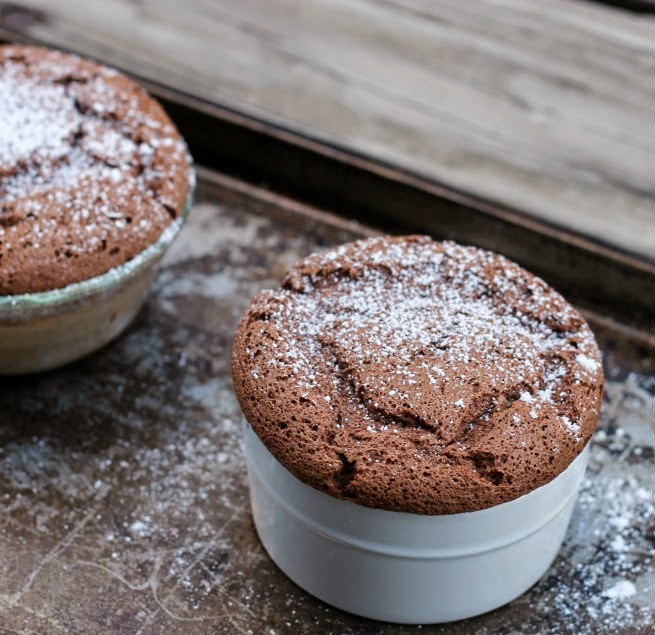 Chocolate + Souffle….what more could you want! Definitely a smile inducing dessert! The only tough part is getting a photo before it deflates…which you did!! 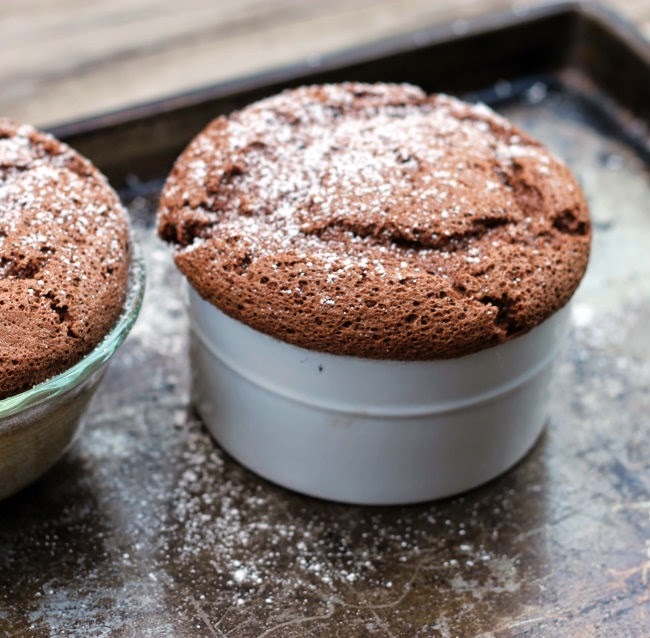 Your souffles look like they turned out great! 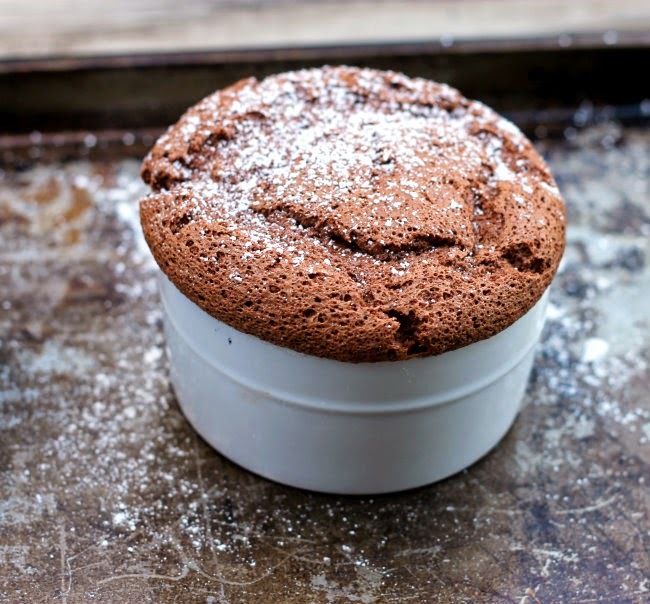 I’ve never made a soufflé but if you made one on a day when everything wasn’t going right then it must be easy…I certainly know it had to be delicious.